Berries are excellent fruits to add to your wild food diet. They’re plentiful, they taste great, and they have been used extensively by Natives in their traditional diets. In this 3-part series, I will be discussing the actions of certain compounds analyzed by the researchers, as well as explaining the potential benefits they may confer to our health. First up: protection against diabetes. Diabetes mellitus is a group of diseases related to the way the body handles blood glucose. In a hyperglycemic state (high blood sugar), the body tends to convert more glucose to a sugar alcohol known as sorbitol. This is done through the enzyme aldose reductase, which, among other places, functions in the eye, kidney, and myelin sheath. Normally, only a small amount of glucose is converted to sorbitol, but in a hyperglycemic state the conversion is increased. Excess sorbitol in the body can result in vision problems, kidney problems, and nerve damage. In short, extra aldose reductase activity is associated with diabetic complications. The researchers found that all four berries demonstrated the ability to inhibit aldose reductase, with serviceberries and highbush cranberries showing the most effect. Inhibiting aldose reductase means producing less sorbitol, which could lead to fewer eye, kidney, and nerve complications associated with diabetes. Furthermore, the berries also displayed the capacity to improve glucose uptake. In addition to aldose reductase inhibition, berries, on average, contain less sugar than other fruits, with wild berries generally having even less than their cultivated counterparts. This should also be kept in mind for individuals with diabetes. It’s important to note that it hasn’t been proven that these berries decrease diabetic complications, but that certain compounds isolated from them may have the ability to do so. Still, the Natives consumed these berries and no doubt reaped the rewards that the phytonutrients provided. What can you do? 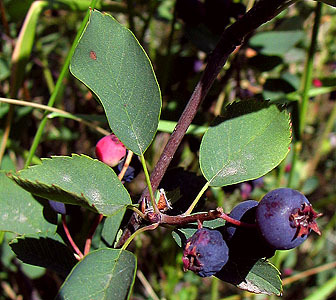 See which wild berries inhabit your ecosystem and harvest them in season. I like to freeze and later add them to blended drinks throughout the autumn and winter months, thereby extending the benefits they provide. Especially if you are dealing with any blood sugar issues, consuming wild berries in addition to practicing healthy lifestyle habits can support blood sugar regulation. Next up in this series: wild berries and inflammation.